Bozeman is a city in and the county seat of Gallatin County, Montana, United States, in the southwestern part of the state. On the 1st (Mon), get curious at Museum of the Rockies and then make a trip to Emerson Cultural Center. To find traveler tips, where to stay, and more tourist information, refer to the Bozeman trip planning website . Dallas to Bozeman is an approximately 5.5-hour flight. You can also drive. The time zone changes from Central Standard Time (CST) to Mountain Standard Time (MST), which is usually a -1 hour difference. Traveling from Dallas in April, things will get much colder in Bozeman: highs are around 56°F and lows about 28°F. Cap off your sightseeing on the 1st (Mon) early enough to go by car to West Yellowstone. On the 2nd (Tue), look for gifts at Eagle's Store, then find something for the whole family at Yellowstone Big Gun Fun, and then identify plant and animal life at Grizzly and Wolf Discovery Center. To find reviews, traveler tips, other places to visit, and tourist information, go to the West Yellowstone trip itinerary planner . Drive from Bozeman to West Yellowstone in 2 hours. Alternatively, you can take a bus. In April, West Yellowstone is a bit cooler than Bozeman - with highs of 44°F and lows of 22°F. Finish your sightseeing early on the 2nd (Tue) to allow enough time to drive to Great Falls. Great Falls is a city in and the county seat of Cascade County, Montana, United States. Start off your visit on the 3rd (Wed): explore the world behind art at C.M. Russell Museum, then listen to music at Lewis and Clark Interpretive Center, and then play a few rounds at Meadow Lark Country Club. To see maps, other places to visit, where to stay, and other tourist information, you can read our Great Falls trip planner . You can drive from West Yellowstone to Great Falls in 5 hours. Other options are to fly; or do a combination of flight and shuttle. Expect a bit warmer temperatures when traveling from West Yellowstone in April; daily highs in Great Falls reach 55°F and lows reach 29°F. Cap off your sightseeing on the 3rd (Wed) early enough to go by car to Glacier National Park. 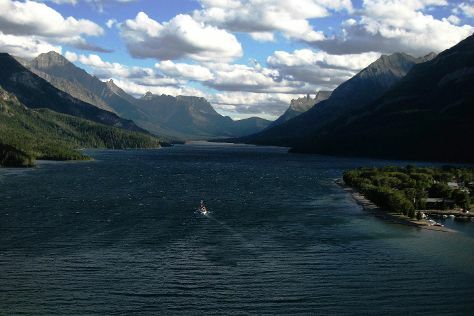 Spend the 5th (Fri) exploring nature at Waterton-Glacier International Peace Park. And it doesn't end there: admire all the interesting features of Going-to-the-Sun Road, take your sightseeing to a higher altitude at Swiftcurrent Mountain, explore the striking landscape at Jackson Glacier Overlook, and appreciate the extensive heritage of Garden Wall. To find more things to do, ratings, where to stay, and tourist information, read our Glacier National Park visit app . Drive from Great Falls to Glacier National Park in 4.5 hours. Alternatively, you can do a combination of bus, train, and car. Expect a daytime high around 56°F in April, and nighttime lows around 30°F. Finish your sightseeing early on the 6th (Sat) to allow enough time to drive to Whitefish. Whitefish is a city in Flathead County, Montana, United States. On the 7th (Sun), fly down the slopes at Whitefish Mountain Resort. For where to stay, maps, reviews, and other tourist information, use the Whitefish trip planning site . Traveling by car from Glacier National Park to Whitefish takes 1.5 hours. Alternatively, you can do a combination of taxi and train. Expect a daytime high around 56°F in April, and nighttime lows around 30°F. Wrap up your sightseeing by early afternoon on the 7th (Sun) to allow time for travel back home.